We have a new Twitter presence @SDFpodcast, and of course we encourage our growing base of loyal listeners to (re)tweet and like and generally spread the word. Engage with us. Praise us where you feel praise is due. Criticise and correct us where you feel that is warranted. We are grown-ups, we can take it all. Feedback is always good. We would love to start collecting that elusive currency, the customer rating. And tell us about stuff you want us to talk about, either directly or in the Small Data Forum on LinkedIn. Whilst we have a general direction of travel, we are more than happy to explore some less well-trodden paths. There are always new dots to discover and connect. An acknowledgement of said turbulence led to the formation of CRUISSE, a multidisciplinary academic research initiative of UCL and LSE to explore decision-making in society under conditions of radical uncertainty. And ‘Communicating in Turbulent Times’ was the leitmotif of this year’s National Conference of the PRCA, the leading UK trade body for public relations (where I spoke about measurement and the value of PR, and co-podcaster and Insight Agent Knowles indulged in opinionated tweetery). I thought of something else that connected both events, and that is the long shadow of Edward Bernays. The Guardian published an essay recently about Facebook’s war on free will. It surprised me that the ‘father of PR’ received no mention. Whilst connecting Bernays with a PR industry event is not much of a stretch, when we reflect on decision-making that is in any way, shape or form influenced by media messages and public opinion, we should also remember the psychological roots of the ‘Engineering of consent’. The CRUISSE network’s aim is help society deal with the kind of uncertainty created by the financial crisis, the Brexit decision and climate change. That includes understanding the formation of public opinion. The Small Data Forum podcast will contribute happily. Narrative show notes for every episode that explore the facts (with links to sources) behind the conversations you listen to. A handy playlist feature so you can quickly choose which episode to listen to right on the page. Or just hit ‘play’ and stream them all. 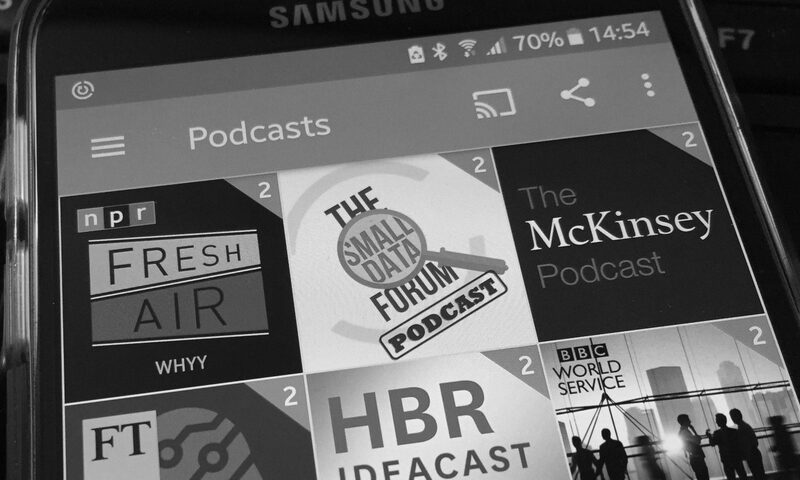 Easy one-click subscribe options to automatically get posts in your email, and audio episodes as they’re published via Apple Podcasts (previously known as iTunes Podcasts) or your favourite podcast app via RSS. Why not sign up now? Our next episode will be out in a few weeks’ time.